PLYMOUTH – Almost every day, there are elite hockey players skating on the ice at USA Hockey Arena. 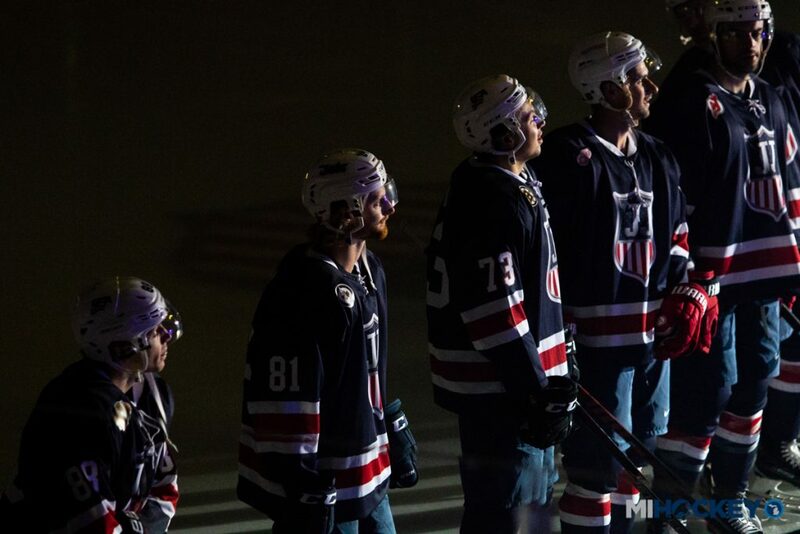 On Sunday, however, the talent on the ice rivaled that of an NHL All-Star Game. 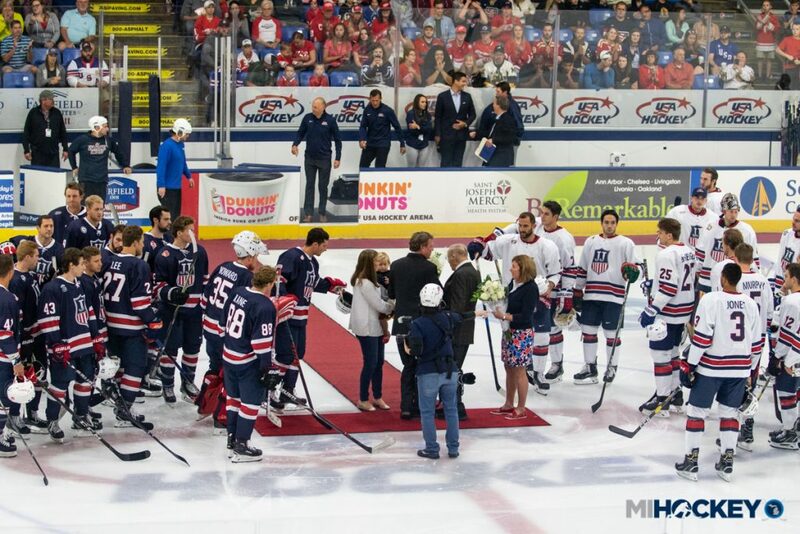 Hockey fans from Metro Detroit and wherever else they traveled in from – there were plenty of Canadian license plates in the parking lot – were treated to a remarkable hockey game at the inaugural Stars and Stripes Showdown game, a memorial event for the late Jim Johannson. 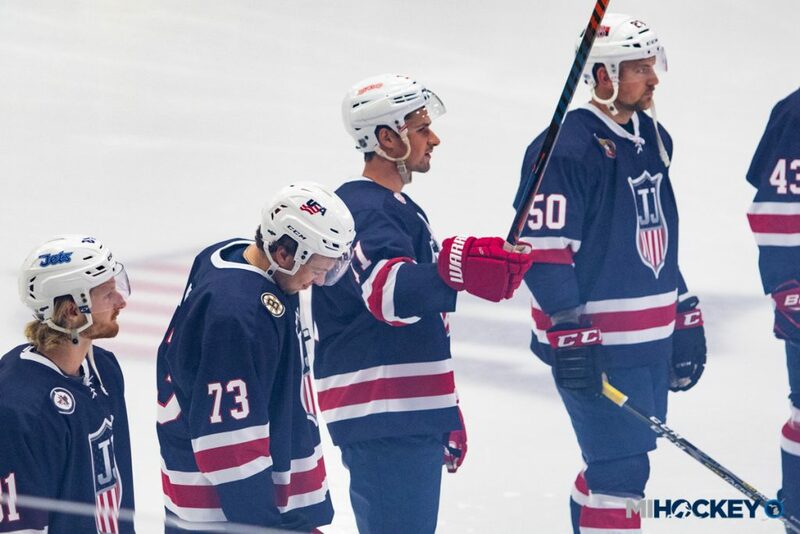 A collection of hockey stars, assembled by Michigan’s own Dylan Larkin, took part in a charity contest to raise money for the Jim Johannson Legacy Fund and the Ellie Johannson College Fund at the home of USA Hockey’s National Team Development Program. The Legacy Fund was established to “support the continued efforts of growing, developing and strengthening American hockey players through initiatives such as player development of our National Junior Team, National Team, National Team Development Program and Olympic Teams.” The College Fund, meanwhile, is to support the daughter of Johannson, after he passed away on Jan. 21 at the age of 53. “At Worlds – after the bronze, came up with the idea, talking with John Jonansson and Pat Kelleher and a couple of guys, we really did rally around JJ at Worlds and we wanted to bring a gold medal for him and I know he would be so proud of that group,” Larkin said after the game. “After every game we had a hard hat and we shared it after every game or every practice we gave it a new guy. It wasn’t supposed to be this way but everything shared their story about JJ and how they met him or if they didn’t know him, something that he’s done for them. Everyone has a different story. If someone didn’t know him or knew him and was best friends with him, just to hear how much he did for anyone, he’d give the shirt off his back for anyone. 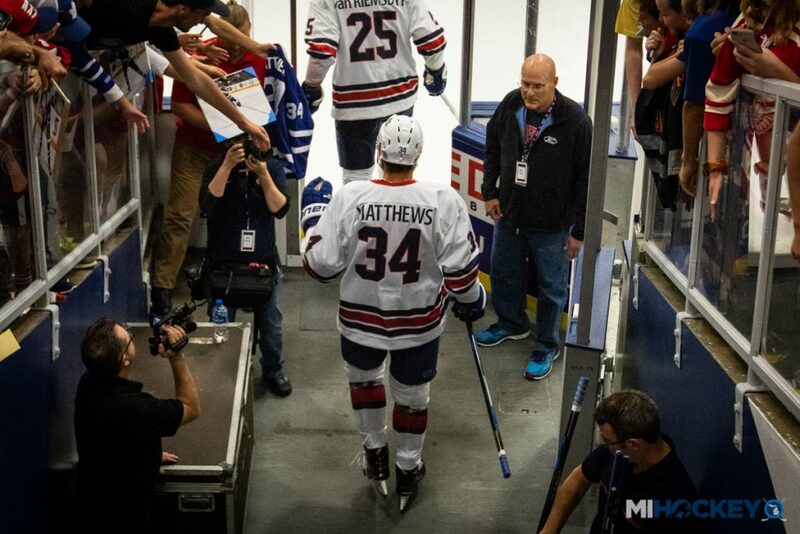 Patrick Kane, Austin Matthews, Zach Parise, Seth Jones, Nick Foligno and James van Riemsdyk were just some of the U.S. hockey stars who showed up in support of Johannson’s family and friends. Jeff Blashill served as one of the coaches for event at the sold-out USA Hockey Arena, as did John Hynes, David Quinn and Tony Granato. After a ceremonial puck drop with the Johannson family, the players put on a highlight-reel of a hockey game during the friendly contest. 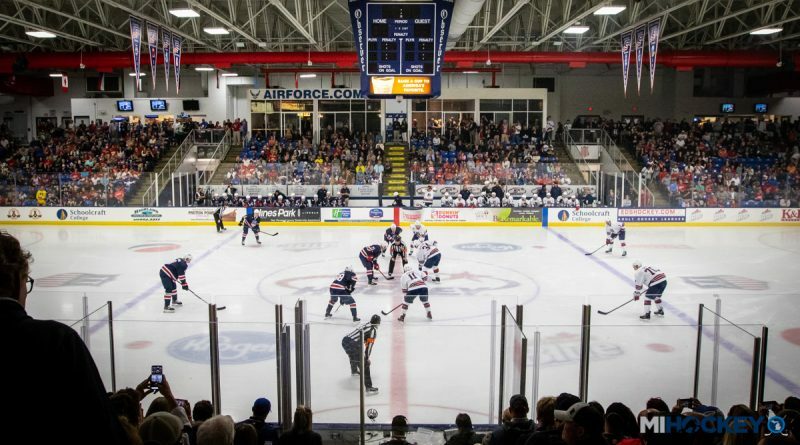 Other festivities at USA Hockey Arena included a live game-worn jersey auction, an online auction featuring game-worn jerseys and autographed NHL memorabilia, in-arena raffles and more. For the record, Team Blue beat Team White 14-9 in front of 3,890 hockey fans at USA Hockey Arena Sunday afternoon. Larkin, Trouba, Connor and Glendening all had two-goal outings; save percentages and goals-against averages for the goalies need not be mentioned in the defense-optional affair.